I am not a fickle mindless drone! Then The Estate of Things introduced me to Fabricadabra and the company's brightly hued ikat pillows. Embraced! Being a fickle mindless drone, though, I hesitated to actually spend money on ikat anything lest it end up as a closet floor pillow in six months like my Imperial Trellis. Thus this project came about. Ikat fabric is a commitment. Ikat paper is not. I started with four boxes that office paper comes in. 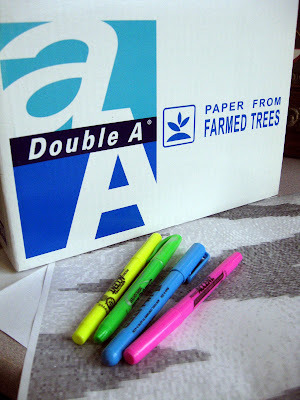 I love these boxes from the Double A paper company - they are small and sturdy and just the right size for storing . . . paper. I considered covering them in fabric or wrapping paper but didn't have anything I liked, and buying something goes against the grain. 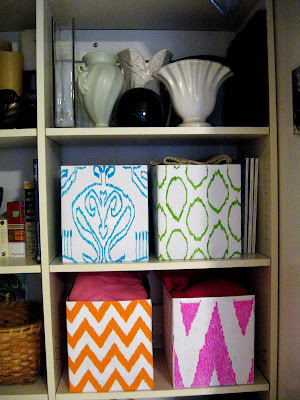 If I'm going to spend money, I might as well just buy a decorative storage box to begin with. 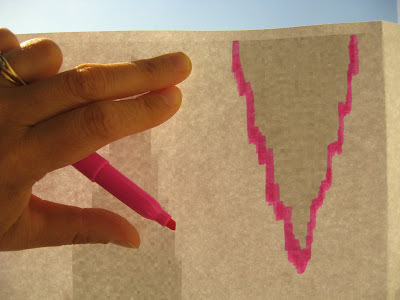 Also, no one seems to make ikat paper. For the first box, I tried spray adhesive. 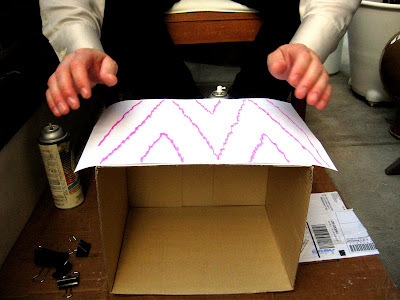 If you use this, spray and then allow the adhesive to dry about 30 seconds before placing the paper on the box. For the remaining boxes, I used double-sided tape. 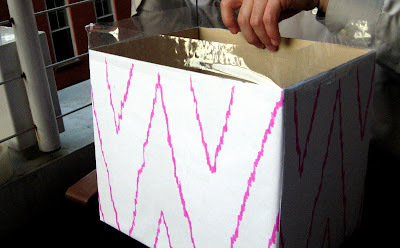 Packing tape can be used to protect the top edge of your box from wear and tear. 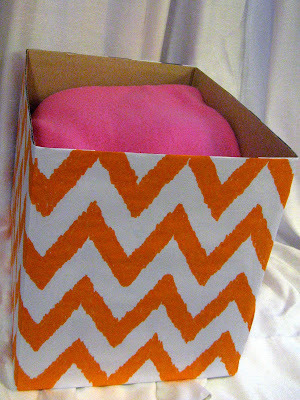 Below is a finished box. 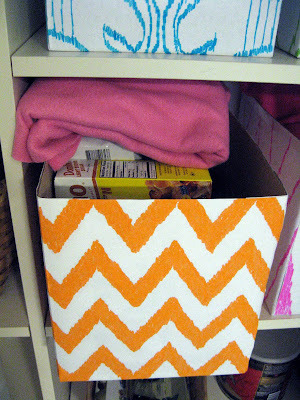 I used the boxes to corral a lot of the small unattractive stuff that gathers in our pantry. Then I topped them off with some of the myriad pieces of craft fabric I've accumulated. Total cost: less than 50 cents a box. Those look fantastic! 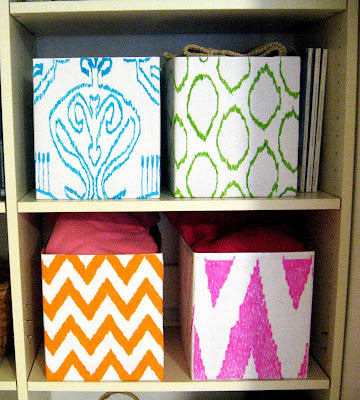 What a great way to incorporate a trend cheaply...I'm always hesitant to go trendy because I'm too cheap. :) I've also tried the spray adhesive route to cover boxes with paper and needless to say, they aren't on display on my shelves. Double-sided tape is a great option. The tape worked a lot better than I expected. The bright colors of the markers really make this project work. I like it! This is darling! Would love to share with my clients. 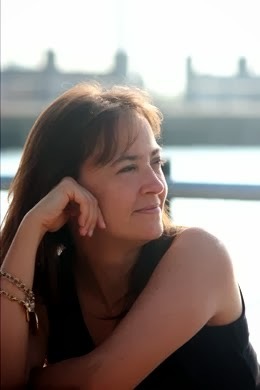 Are you up for me reposting some of your images and linking back? Be my guest. I'd be honored. love, love, LOVE this idea! eeek, you're crafty. So cute! I'm impressed with how these turned out! This is gorgeous and sensible. Love. Genius! Love the colors and the smart simplicity of this project. So glad to have found your blog!